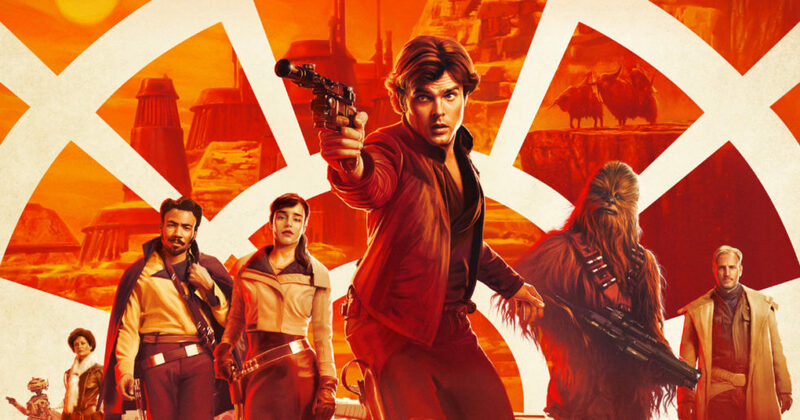 The newest contribution to the Star Wars film universe, Solo: A Star Wars Story, has a lot to offer libertarians, lovers of underdogs, and modern-day pirate enthusiasts. Director Ron Howard’s craftsmanship has created a well-executed action movie that entertains even if it doesn’t bedazzle audiences with special effects, a plethora of really quirky characters, or mind-bending plot twists. Howard (A Beautiful Mind, The Da Vinci Code, Frost/Nixon) delivers a solid movie that provides some of the backstory for a popular character leading up to Star Wars: Episode IV: A New Hope even if it does fall short of a true origin story. The movie starts with a youthful Han Solo (Alden Ehrenreich, Hail, Caesar!, Rules Don’t Apply), bucking against gangs that rule the shipbuilding world of Corellia. Solo longs to become an imperial navy space pilot and plots to escape the planet with his girlfriend Qi’ra (Emilia Clark, Game of Thrones, Terminator Genisys, Me Before You). They are separated during their escape, but Solo forges on. His arrogance, rebelliousness, and resistance to authority, however, get him reassigned to the infantry battling for the planet Mimban. Solo’s path crosses with the leader of a criminal gang, Tobias Beckett (Woody Harrelson, Hunger Games trilogy, War for the Planet of the Apes, Three Billboards Outside Ebbing, Missouri), in the heat of a battle (aesthetically reminiscent of trench warfare from planet Earth’s twentieth century World War I or the brutal slog that is the setting for the film Edge of Tomorrow). So begins his evolution into a space pirate and smuggler. Solo soon sees that joining the criminal gang as the best way to get back to Corellia and rescue Qi’ra. Little does he know that Qi’ra is now embedded in the criminal syndicates that prowl and control much of the Galactic Empire. She is dispatched by Dryden Vos (Paul Bettany, Avengers: Infinity War, Captain America: Civil War, Avengers: Age of Ultron), a crime boss in the Crimson Dawn syndicate, with Beckett and his gang to steal an unrefined hyperspace fuel called coaximum. Along the way, audiences discover how Solo meets Chewbacca (Joonas Suotamo, Star Wars: The Force Awakens, Star Wars: The Last Jedi), smuggler Lando Clarissian (Donald Glover, Spider-Man: Homecoming, The Martian, The Lazarus Effect), and the funny scene-stealing robot L3-37 (BBC sitcom star Phoebe Waller-Bridge). From there, the story unfolds along a conventional albeit engaging trajectory. More notable may be how Solo embeds individualist themes in the story and the personalities of its characters. Each character has an arc forcing them to navigate independently and creatively to change events in their favor order to survive. The main characters retain their humanity as well as their roguish tendencies, giving audiences a reason to root for them while enjoying contrarian personalities. The Galactic Empire is never really seen or referenced except during Han Solo’s attempts to join the academy as a cadet. Instead, the criminal gangs operate as independent organizations and through cooperative agreements with various characters and entities. While Vos, the sub-boss in the Crimson Syndicate, is ruthless, the main characters chart their own paths to secure their own identity based on individual goals and objectives. Audiences empathize with the smugglers, pirates, and gang leaders because they recognize they have little choice given the world in which they operate. Yet, these characters still retain their soul, unwilling to give up the humanity that ties them together. Solo falls short as a true origin film—we really don’t learn much about Han Solo’s early life or background—but it’s a fine space romp suitable for a wide range of audiences. Artistically, the movie doesn’t push boundaries, falling well within its PG-13 rating. The anti-authoritarian themes and Han Solo’s distaste for hierarchy will appeal to many across ideological spectrums. The more liberty-minded will find the storyline comfortable and the characters roguish enough to retain a sense of community and affinity without losing their personal identities.